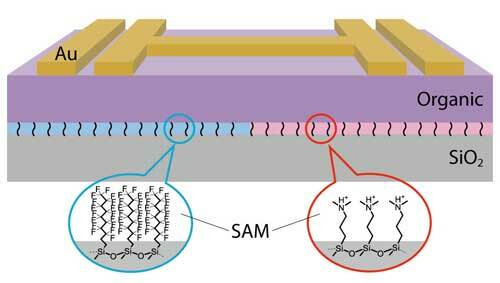 (Nanowerk News) High-speed manufacturing of wearable computer chips may benefit from thin-film technology developed at RIKEN that ‘kills’ stray electronic charges inside multifunctional polymer transistors (Advanced Materials, "Control of major carriers in an ambipolar polymer semiconductor by self-assembled monolayers"). Printing electronic circuits with inks made from organic semiconducting polymers significantly reduces costs and boosts efforts to put computers onto unconventional substrates such as paper and plastic. Polymers that can move both negative electrons and positive charges are especially sought after for this approach. With just a single deposition, such ambipolar inks can produce logic gates for complex integrated circuits, eliminating the need for devices with multiple layers. However, intrinsic problems with ambipolar polymers have prevented their widespread adoption. The biggest of these, according to Kazuo Takimiya and Masahiro Nakano from the RIKEN Center for Emergent Matter Science, is that the ability to move both kinds of charge carriers makes it hard to turn logic gates completely off. That is because an uncontrollable leakage current usually flows, which increases power consumption and signal noise. “We’ve even been told that ambipolar materials are useless for transistors,” concedes Nakano. Undeterred, Takimiya and Nakano explored ways to reduce unwanted carrier contributions using self-assembled monolayers (SAMs)—thin films made from waxy molecules that spontaneously stick to surfaces. Inspired by recent reports that SAMs containing fluorine atoms can trap electrons when wedged between a semiconducting polymer and an insulator, the RIKEN researchers envisioned that by appropriately placing SAMs with both negative and positive charges they could neutralize ambipolar leakage currents. But to implement this concept, the team had to abandon the conventional epoxy resins used to coat and protect polymer transistors from oxygen-related degradation. Instead, they designed a polymer that is both ambipolar and stable in air—a rare chemical combination, notes Nakano, since oxidation-resistant plastics usually have trouble retaining electrons for charge transport. Polymer building blocks made from electron-deficient, naphthalene-like aromatic rings provided the characteristics needed for open-air printing. Coating the new ambipolar polymer with negative- and positive-charge gathering SAMs (Fig. 1) dramatically improved transistor operation—the logic gates displayed near-ideal switching characteristics, and leakage currents diminished by two orders of magnitude. Because this strategy enables transistor charge polarity to be selectively isolated by using simple patterning procedures, the researchers believe it could easily be scaled up for printable circuits.